This is the public profile of VacuumGlow, Additional information and high-resolution images are available for accredited press members, to access additional information about VacuumGlow please login as a press member. About VacuumGlow : Design is not my profession. I am a businessman but also a creator. Sometimes I come up with some combinations in my head and I am sure that if it will be realized, then we´ll get an awesome product design. That happens due to the feelings, some common vision and visual parts. That also happened with our VG clocks and continues with the development of the new products. Our VacuumGlow clocks design grew out of my hobby. 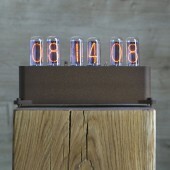 I am interested in the nixie tubes and generally in the lamp technics. Such tubes are used there by the way. I was bored once and wanted to make up a nixie tube clock for myself. Afterwards that became a project. When I have an idea of a new model, I do want to make design perfect - as I see it by myself. So the any part has a solid image and its own special aesthetics. But at the same time, I still cannot call myself a designer. Press Members: Request an exclusive interview with VacuumGlow.